CES 2012 came and went, and while there were literally hundreds – or perhaps, thousands of new devices that were launched across over a million square feet of showfloor space, not all of them made it to our hallowed pages. Well, Violet’s Karotz does have a place, though, simply because it has been a long time in coming. The long-awaited US launch has finally happened, with this being the self-claimed first hardware device to date that was tailor made for Facebook, the world’s most popular social network at the moment with more than 800 million users and counting. Just in case Karotz looks familiar to you, that is because this is the third generation “rabbit” from the Nabaztag line. Being an immensely popular robotic companion that actually changes the way you live out your daily life, as it is capable of delivering a link to the family, friends and the world. With Facebook compatibility thrown into the mix this time around, it will complement Karotz’ already impressive range of features. 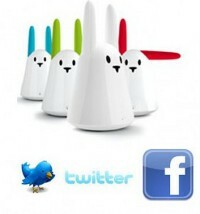 This is a rabbit that you would love to keep as a digital pet of sorts, since it will also play nice with other key social media sites including Twitter, letting you interact with others over your new favorite desktop companion. Friends can also take control of your new Karotz in order to communicate with you, sending messages as well as audio files, while using the Karotz integrated webcam to see what it can see. Send a poke and Karotz’ ears will move, or they can even change the color of its light in order to get your attention when all other forms of online communication fails. There is also a free Karotz Controller application which you can download from the Apple App Store and Android Market just to get you started!